Honestly … Can We Talk About Truthfulness? With what seems like a continual flow of untruthfulness from our politicians and the media, is it any wonder that we have become numb to truthfulness. “Reality” television shows retake scenes until they get it to a point that will captivate the audience … and in doing so they move further away from the truth and further away from reality. Whether it is by omission or the careful selection of one’s words … being untruthful is the same as lying! 1. We are ashamed of what we did and don’t want others to know? 2. We don’t want people to see a side of us we don’t like. 3. 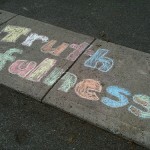 We would rather deny our true feelings about something, someone, or some situation than speak the truth. 4. We want to control or manipulate someone else or a situation to our benefit or to protect what others think about us. 5. We are afraid of losing something or someone we value (we just don’t value them enough to tell them the truth). 1. We say that telling the truth will do more harm than good. 2. We believe we are doing the right thing by not telling the truth. 3. We think not telling the truth in this situation is better for all involved (but really it is mostly better for you). 4. We tell ourselves it isn’t/wasn’t a big deal. 5. We believe we know what’s best for the other person or group involved. 1. We deceive ourselves and have to live with the consequences (this doesn’t work if you have a sliver of a conscious). 2. The truth eventually comes out and the damage is worst then if you would have been honest from the start. 4. There will always be a gap or chasm between you and the other party that lives just below the surface and keeps you from an authentic relationship. 5. You will find yourself projecting your dishonesty on others and that eventually leads to misery and alienation. 1. You respect yourself and the other person or parties involved. 2. You take 100% responsibility for yourself and your actions. 3. You choose integrity and authenticity instead of disingenuous-ness and control. 4. You create an opening for authentic relationship. 5. You put out into the universe what you actually want for yourself. Being dishonest, hiding the facts, spinning the truth, and lying by omission, creates a barrier between you and others … it is exactly the same as putting on a mask so no one can see the real you. Some folks who are consistently untruthful wonder why people don’t “reaaaallly” love them … how could they when you wear a mask that hides your “true” self from others. This is one reason why some folks can feel isolated and alone in a room full of people or in relationship with others. Remember … you always have a choice to be truthful or not … honestly!